Amazing home theater setups have long been associated with wealth, luxury, and innovation. Just as palaces of the Renaissance included grand stages with curtains and balconies, so do many of today’s most amazing mansions and estates boast state-of-the-art theater systems. 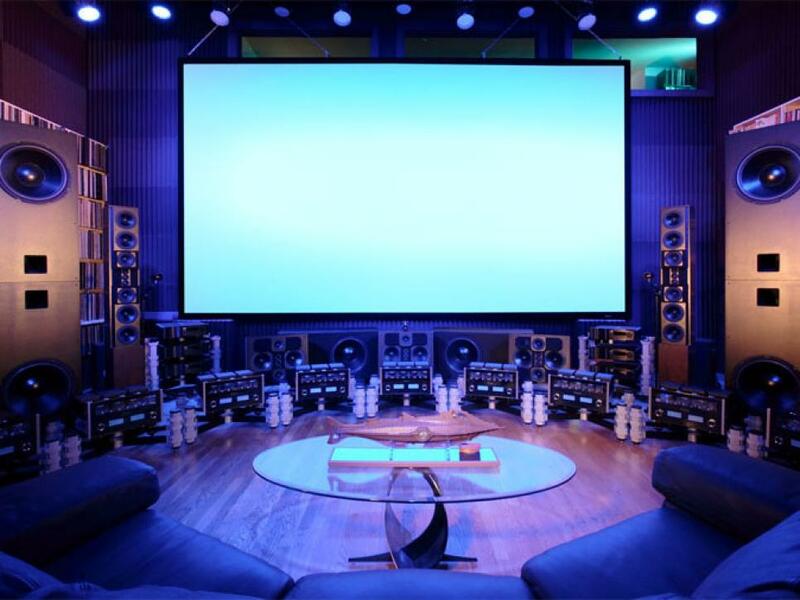 For this article, we searched through dozens of home theater setups, surround-sound programs, screens big and wide and tall, plush chairs, and even fully functioning bars to find these 30 amazing home theater setups you have to see to believe. This theater, designed by Elite Home Theater Seating, is a stunning throwback to the glamorous movie palaces of the 1920s. Each of the 12 comfortable chairs are outfitted in custom fabric, and the luxury is continued throughout with such features as an embossed copper ceiling, moldings and pillars, textured walls, and even a chandelier. 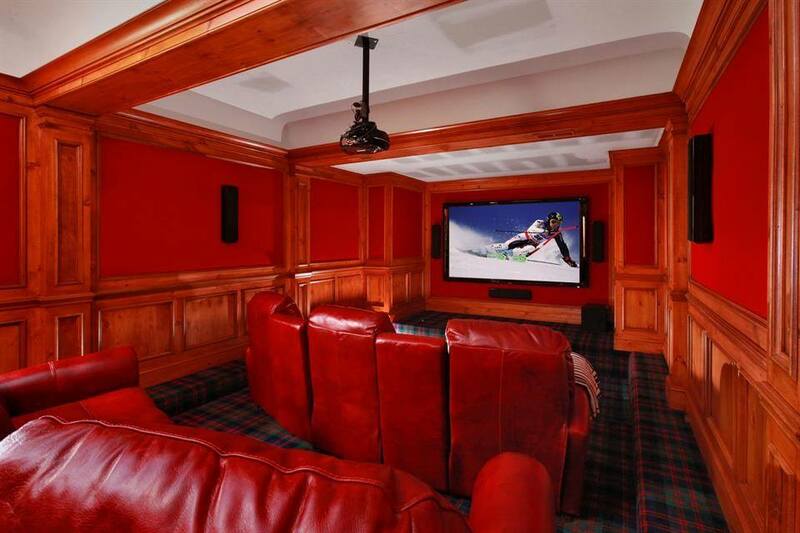 We can imagine even Chancellor Palpatine relaxing and enjoying a movie in this cool home theater. Inspired by the iconic Star Wars villain’s office, this screening room was designed by DreamSpace and Cinema Design Group International. Custom acoustical panels make for a perfect sound experience, while luxurious recliners are ideal for relaxing. The curtained main stage of this beautiful home theater is so large its owners often host live classical music concerts as charity events. But this stunning space is perfectly designed for a relaxing night in with family, too. A simple press of a button reveals a 16-foot wide screen, while the ornate walls of the theater (faux lit for a true theater-like experience) are made with soundproofing drywall to isolate and improve the theater’s sound quality. 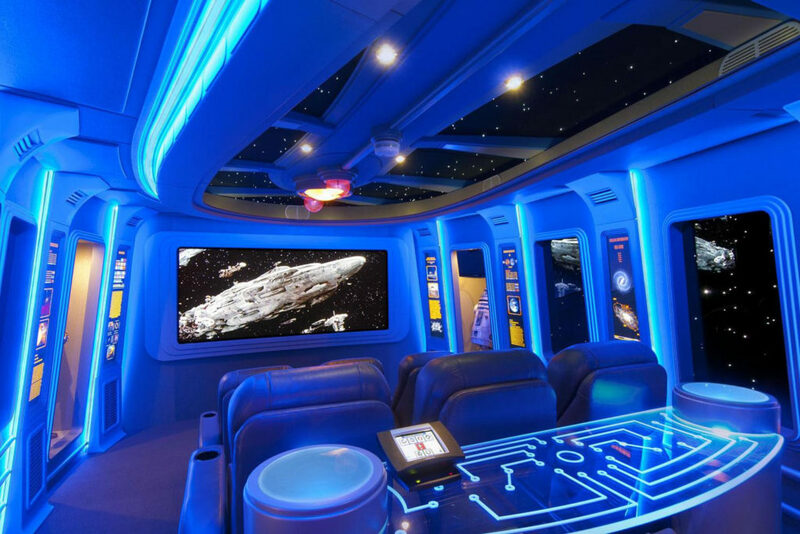 This incredible Star Wars-themed home theater is owned by none other than the president of the Star Wars fan club. Designed to resemble the Death Star, the theater consists of three rows of plush leather seating, a big screen, and plenty of fun, futuristic lighting. Replicas of famous Star Wars characters — such as C-3PO, Han Solo, and Boba Fett — also make appearances. The car-loving owners of this amazing Connecticut home sought to carry their car theme into their home theater. Inspired by the drive-in theaters of the 1950s, this media room includes fun wall decor, a full snack bar, a star-studded ceiling, and even indoor palm trees. 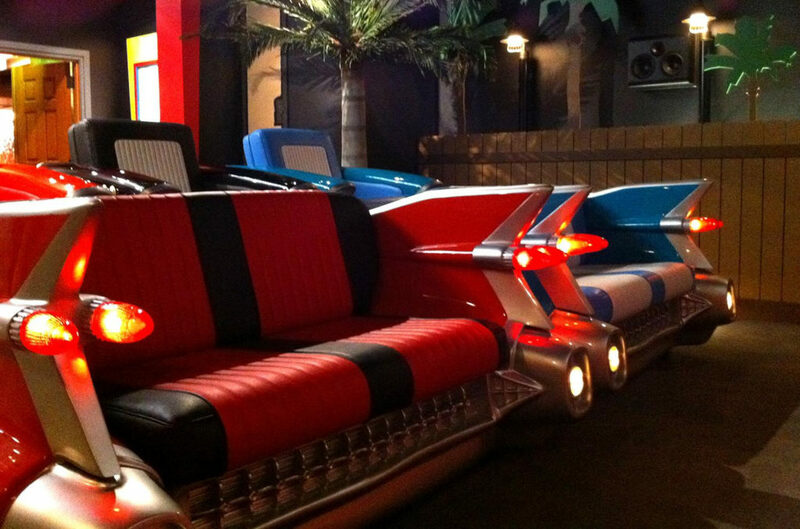 While real cars couldn’t be used for seating, designer Theo Kalomirakis was able to make custom, one-of-a-kind theater seats that are sure to make viewers feel like they’re at a real drive-in. 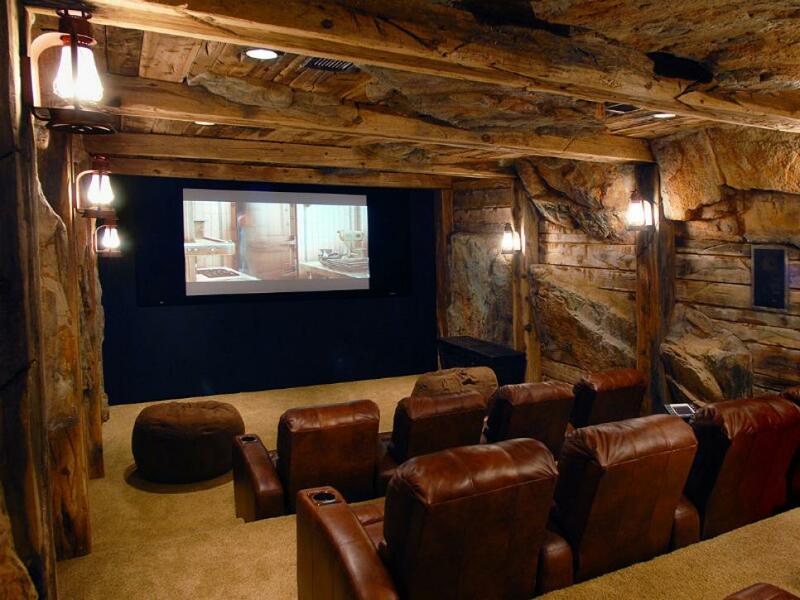 While designing this home theater, the designers at Aurant took inspiration from the historically significant mining town in which this incredible and unique media room is located. Designed to look like an 1800s mine shaft, the theater includes eight leather recliners, cave like walls, a large screen for optimal movie viewing, and true-to-theme lanterns. Yet another innovative home theater by the geniuses at Elite Home Theater Systems is this Batman-inspired setup. 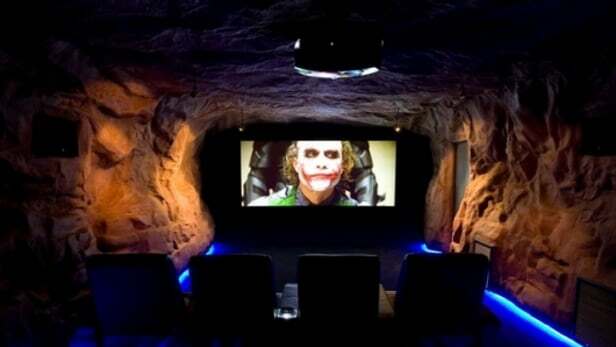 A dozen leather loungers make for a comfortable view of the big screen, while the surrounding walls are designed to look just like Bruce Wayne’s iconic Batcave, complete with bat sconces and stalactites. 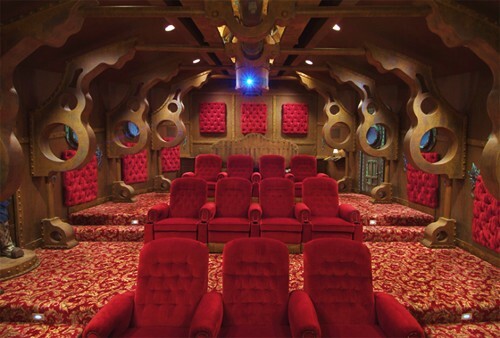 Designed by Dillon Works and inspired by Disney’s take on Jules Verne’s 20,000 Leagues Under the Sea, this incredible home theater will make its audience truly believe they’ve entered a new world underwater. 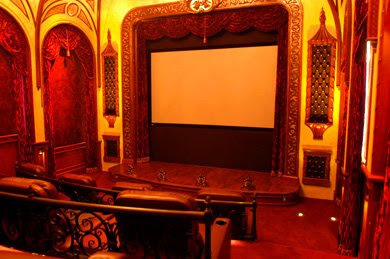 The theater, located in a private home in Texas, includes velvet walls, distressed “trusses” and “rusty pipes,” and eleven luxurious red seats. 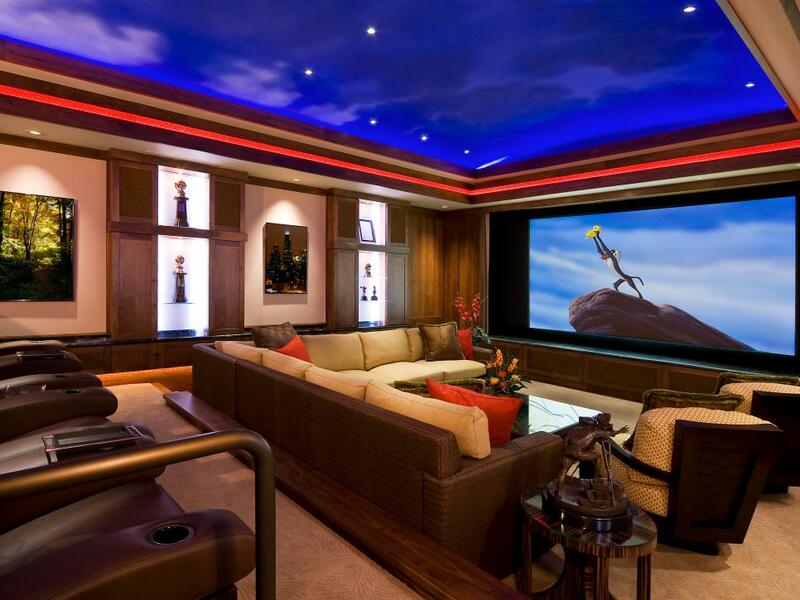 Will and Jada Pinkett Smith’s Malibu home contains this amazing and luxurious home theater. 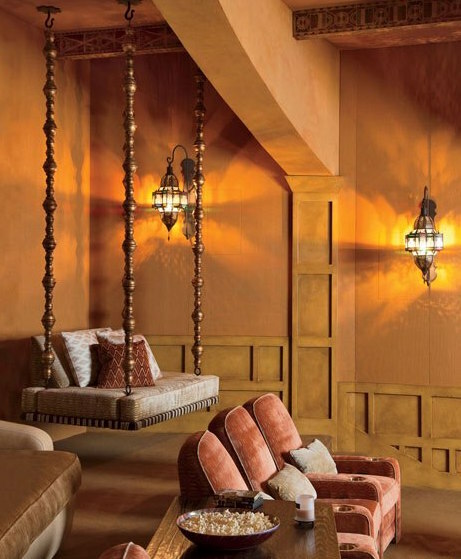 The screening room was designed by Judith Lance, and includes velvet upholstered club chairs, Moroccan-style lanterns, a daybed suspended from the ceiling, and of course, a big screen perfect for watching the latest Hollywood flicks. 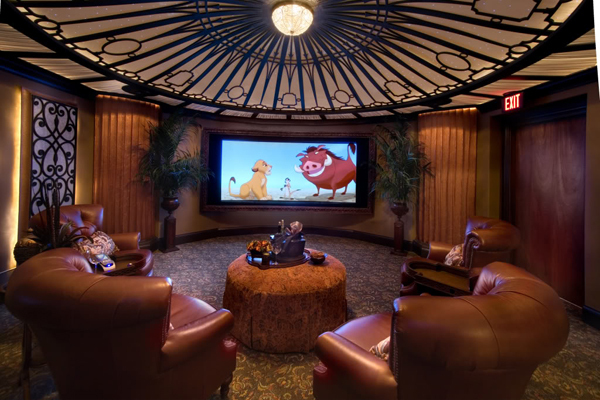 Disney-like whimsy meets the romance of Arabian Nights in this stunning home theater designed to make you feel like Genie or Jeanie. Horner Networks, Amazing Design, and Lutz Decor worked together to create this amazing media room, which includes a plush purple sofa, big screen, chandelier, and ornate iconography on the surrounding curved walls. Home Theater or Opera House? Many home theaters are constructed in converted basements, but not many of those can be called an opera house! This custom home theater, inspired by the classical European opera, is complete with a concession stand, marquee, luxurious chandelier, and even a box office. Three DVD players and a JVC QX-1 projector illuminate movies onto the big screen, while 25hz woofer drivers make for supreme surround sound. 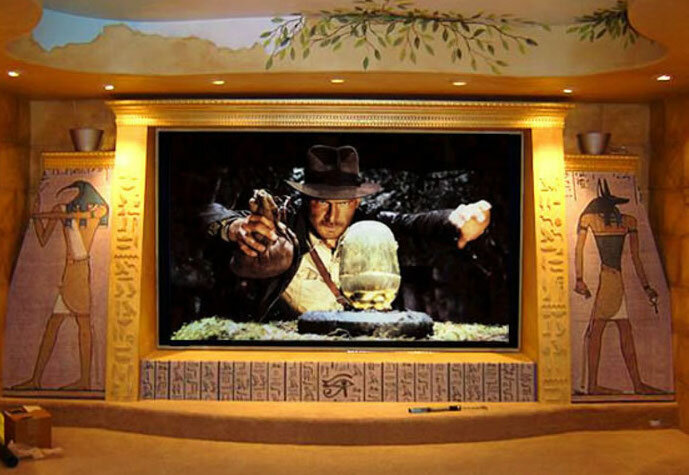 This epic home theater is inspired by the Indiana Jones film franchise. Besides a large screen perfect for a good action flick, the home theater includes plush seating options, well-placed lighting, and tons of original movie memorabilia from Indiana Jones and other movie classics. 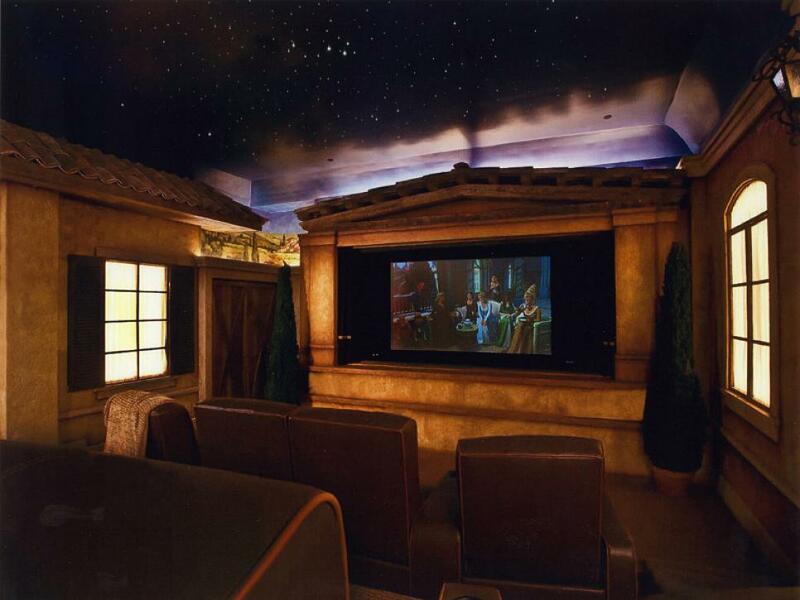 Guests won’t have a hard time finding the right spot in this amazing home theater. The screening room’s intelligent designer created distinct seating zones, with motorized recliners towards the back of the room and living room-style seating nearer the front. The view of the wide screen is perfect from anywhere, while sound is optimized thanks to such features as a domed ceiling and a specially designed baffle wall. 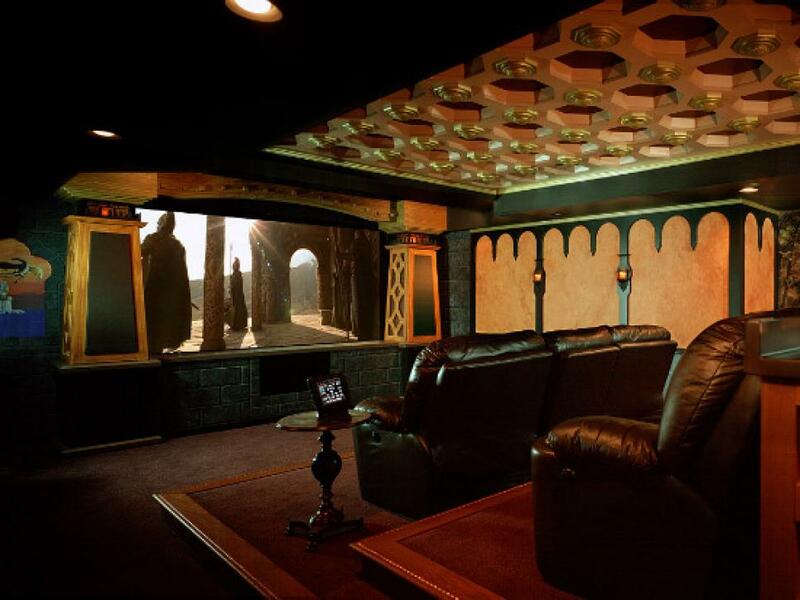 Inspired by the Lord of the Rings films, this home theater is an elegant spot in which to escape to a fantasy world. This state-of-the-art media room, designed by Silver Screen & Sound, Inc., includes a wireless touch-screen monitor, a massive theater-caliber screen, a full wet bar, and plenty of comfy seating. This stunning home theater, featuring wood-paneled walls and plush leather seating, is only a small part of a massive entertainment center. The entire basement level of this Connecticut estate has been carefully converted into 3,000 square feet of entertainment space. Besides the room with the big screen, there is a fully-functioning kitchen, a billiards room, family room, and an exercise room complete with a sauna. 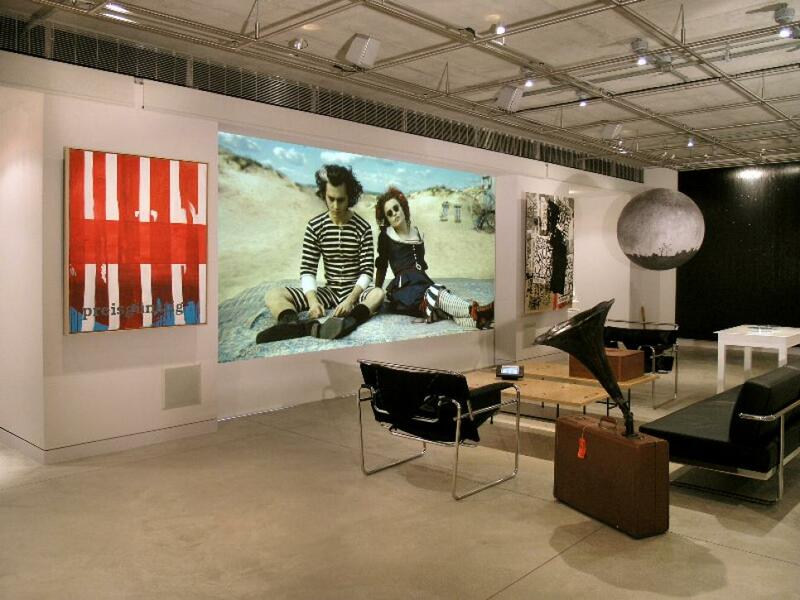 Is it a gallery or a home theater? Baumeister Electronic Architects designed this artsy space that is perfect for entertaining. Paintings and framed photography adorn the walls most of the time, while a 14-foot plasma screen drops down when it’s time for a movie. 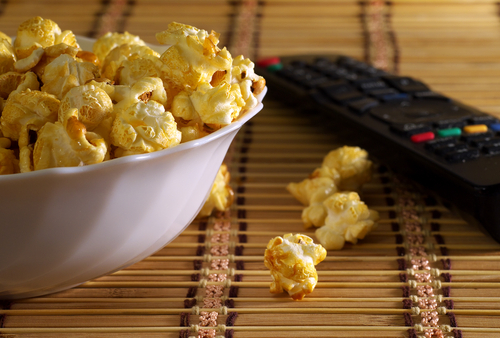 Guest quarters are included, and movie-time snacks can be prepared in the hidden, yet fully equipped, kitchen. 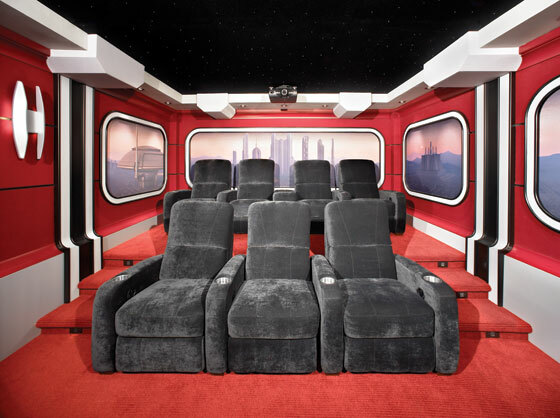 You won’t miss a single free throw in this incredible home theater setup designed by HomeTronics, Inc. 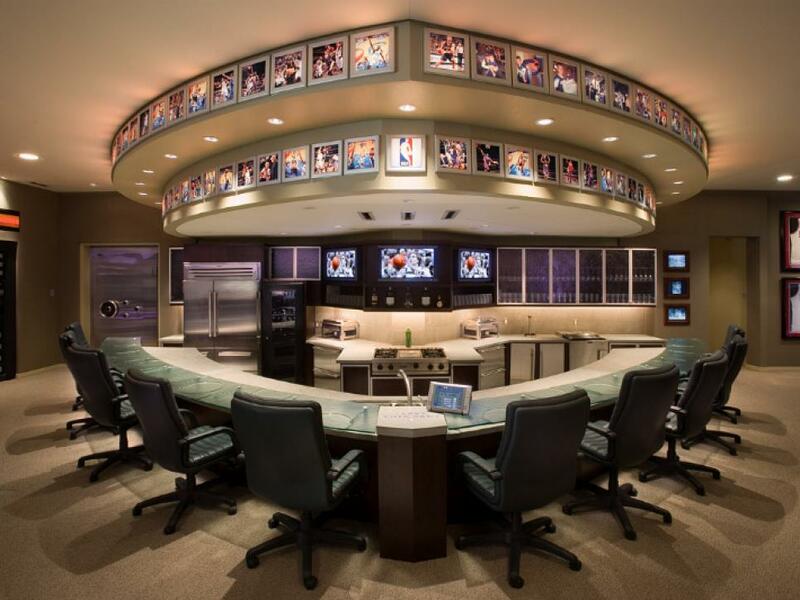 The home theater, which won CEDIA’s 2006 award for the best overall media room, includes a fully equipped kitchen, a billiard and poker area, and more than 20 plasma TVs for watching any and every game available. Who needs luxury recliners when you have a luxury swimming pool?! 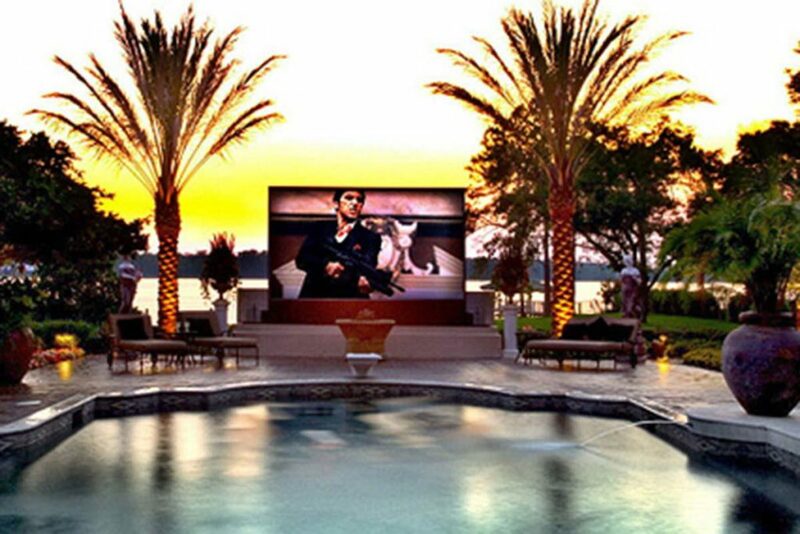 This stunning outdoor theater is specially designed to mix outdoor relaxation with that of entertainment. Guests can lounge in poolside chairs or enjoy views of the big screen from the water. Amazingly, this cool home theater’s outdoor location doesn’t sacrifice any sound quality; surround-sound speakers disguised as rocks are strategically situated throughout the area. Would-be Jack Sparrows can watch their favorite pirate flicks in this over-the-top home theater setup designed by Elite Home Theater Seating. The setup, which is located in Palm Beach, Florida and cost somewhere around $2.5 million, includes a front facade entry, comfortable seating on the deck of the “ship,” and even a tavern-style bar in the back for movie-time snacks. 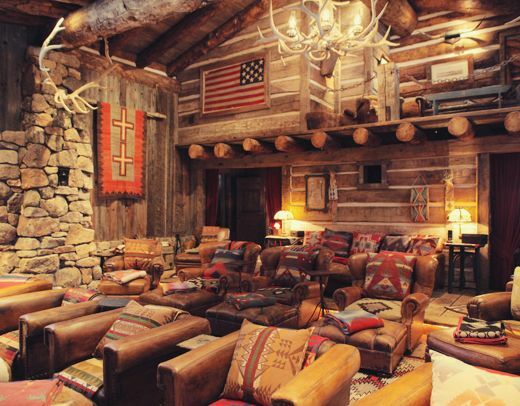 Ralph Lauren’s Colorado-based Double RL Ranch boasts this stunning home theater in which luxury meets the wild west. It can’t be too difficult to cozy up in the handsome leather armchairs decked out with pillows and turn-of-the-century Pendleton and Beacon blankets. Antlers, cowhides, unique textiles, and Ralph’s signature American flag accent the room, though the main focus is definitely the curtained stage and big screen. 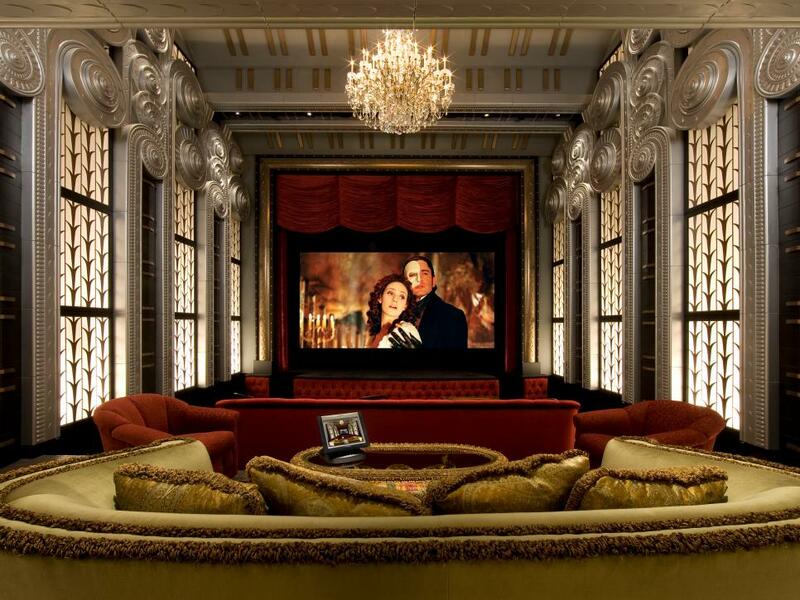 Utah-based Aurant designed this luxurious home theater in the architectural style of a French country chateau. Plush seating faces a big screen, while the “chateau’s” walls and windows are lit up in part by the stunning, star-studded ceiling that contributes to the media room’s epically romantic feel. Designed and constructed by Kipnis Studios head Jeremy R. Kipnis, the well-dubbed $6 Million Theater is likely one of the most amazing home theaters in existence. The theater includes a double-story balcony; an orchestra section complete with special, noise-isolating acoustic materials; and plenty of leather couch-like seating. The real gem of this home theater, however, is the state-of-the-art 22-foot screen, which, once a movie begins, vanishes to reveal a mirage-like image. 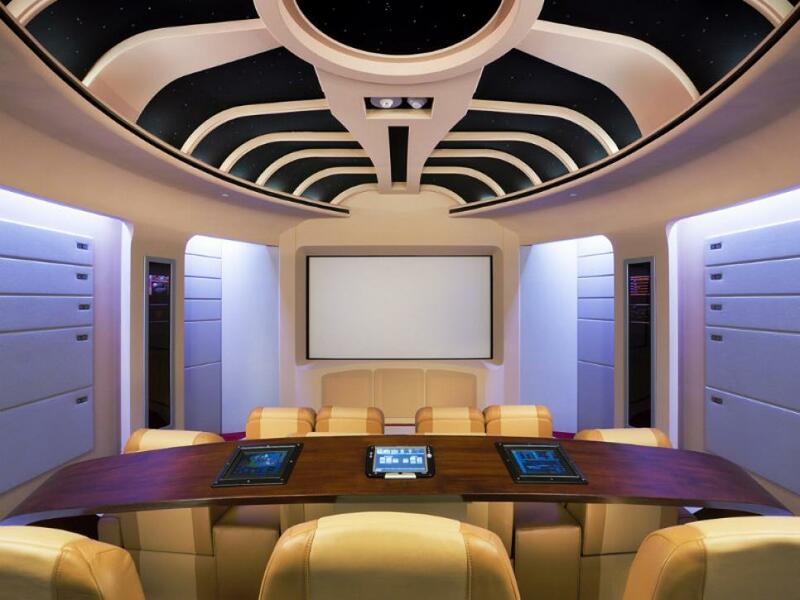 Walk into this amazing home theater and you’ll feel like you’ve just walked aboard the Starship Enterprise. 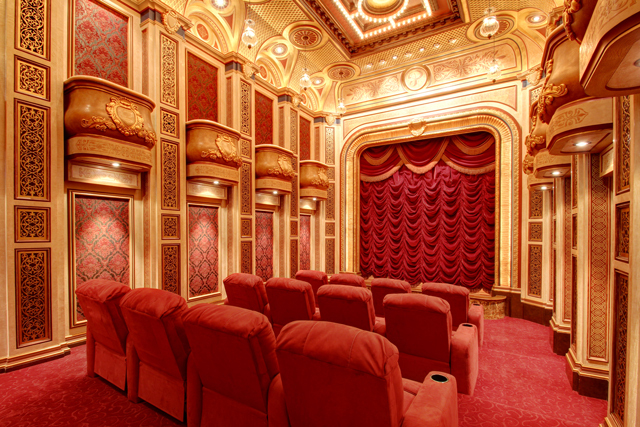 The theater — designed by Audio Advisors, Inc. and located in West Palm Beach, Florida — is full of impressive features such as a large screen, 11 leather seats, and computer-controlled LED lighting. Indeed, this home theater is so impressive it was named by CEDIA as the best overall themed theater of 2007. 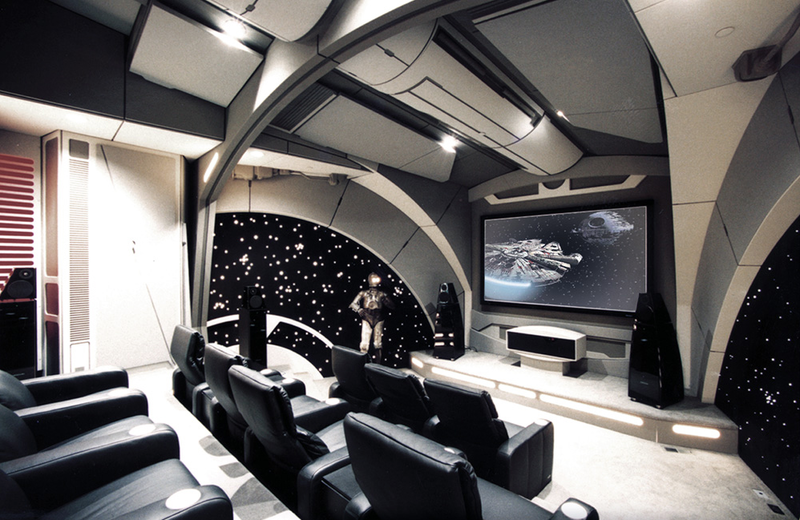 This amazing Star Wars home theater setup will have you exploring the galaxy in serious style. The 10,000-square foot setup is ultra modern, complete with comfy chairs, neon lights, and six flat-panel HDTVs, each with its own touchscreen remote. 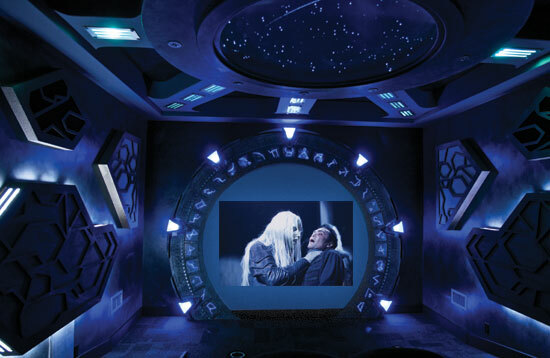 Stargate: Atlantis may not be the popular show it once was, but we doubt this amazing Stargate-themed home theater setup will ever go out of style. The theater includes THX surround-sound speakers, a 10-foot wide circuit screen, two Sony mega-changers that hold up to 800 DVDs, and air pocket doors that open via motion sensor. 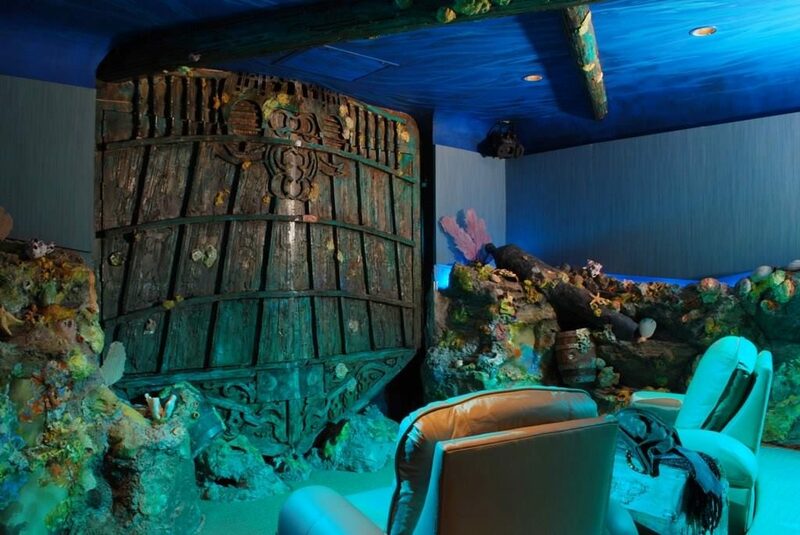 Located on Paradise Island in the Bahamas, this incredible home theater is designed to look like a realistic under-the-water view of a sunken pirate ship. The high-powered audio system is world class, but it’s the incredible visual system that is especially worth writing home about. The hull of the “sunken ship” opens via remote to reveal a massive, 110-inch movie screen. This Mediterranean-style estate in Florida boasts a number of incredible features including “The Village,” an entire wing of the house dedicated to entertaining. Besides a fully functioning pub, a poker and cigar room, music lounge, ice cream shop, and a library, “The Village” has this stunning movie house designed like the Old World theaters, complete with a dozen recliners and a curtained stage and screen. 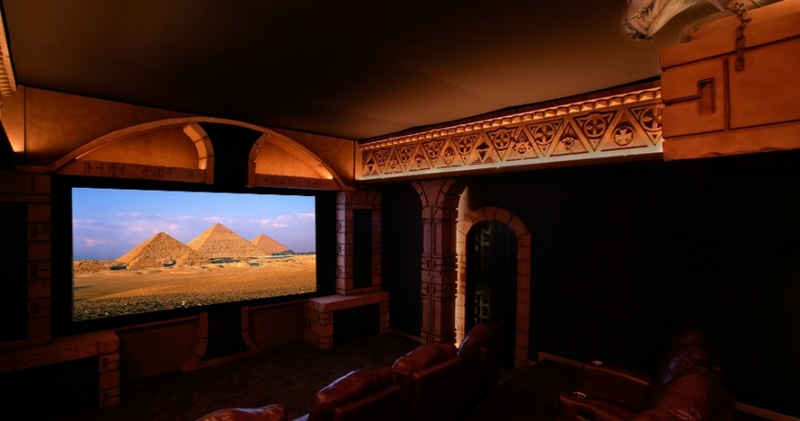 This home theater, designed and installed by Admit One, would surely make Lara Croft proud! The Tomb Raider-themed media room is inspired by the action franchise, and comes complete with stone-like walls intricate design work, comfy leather recliners, and even a gargoyle. 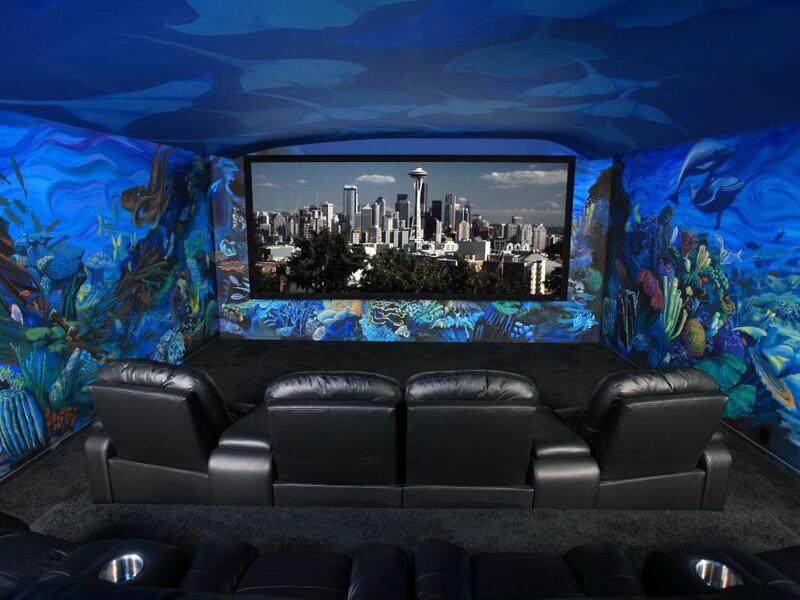 Ocean lovers will feel right at home in this stunning and amazing home theater. Thanks to the 360-degree ocean-scene mural, the big screen almost looks as if it is floating, while an asymmetrical ceiling evokes feelings of gently rolling waves. Comfy recliners and thick-pile carpet add to the room’s incredible level of comfort. 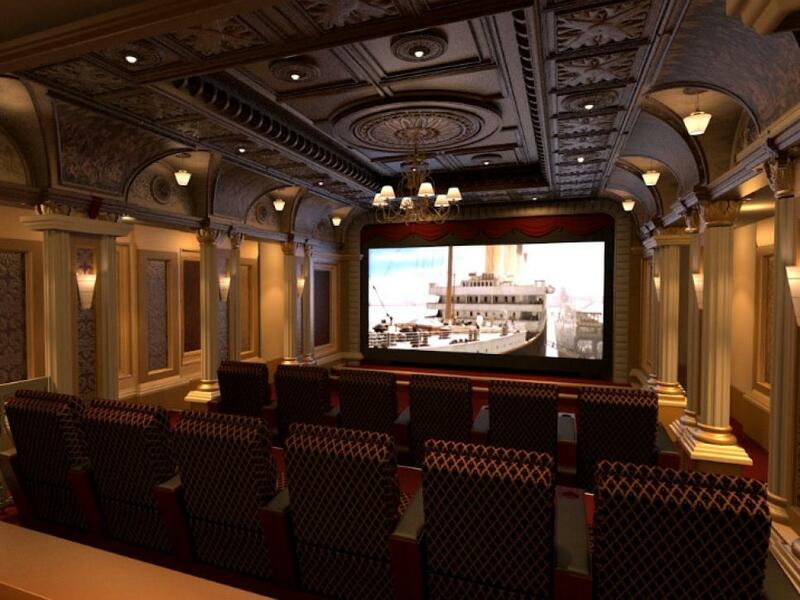 This amazing home theater is a luxurious space inspired by James Cameron’s Titanic. Viewers can watch the big screen from leather wing-backed chairs, or sit at one of the mahogany tables for a snack or card game. Everything from the paneled walls to the detailed lighting fixtures exude first-class luxury, though the crown jewel of the room is undoubtedly the incredible circular ceiling.